Pictured: Southland first grader, James Graft, uses a whisper phone while reading. 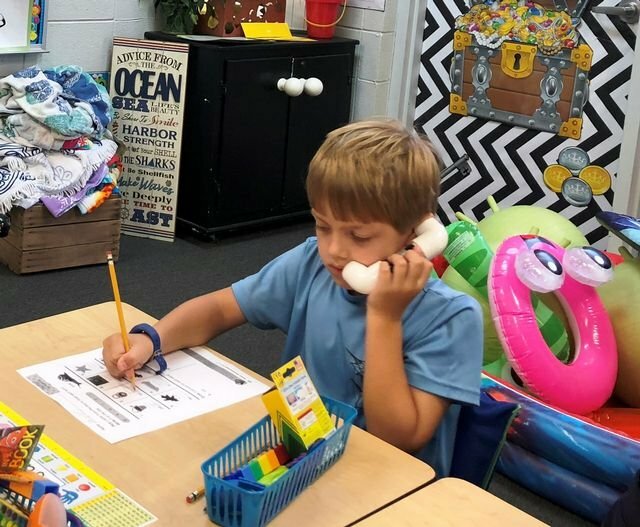 Southland Academy first grader, James Graft, uses his whisper phone while completing a class assignment independently. Whisper phones allow students to hear themselves read; therefore, helping them to become more fluent readers. A whisper phone is a small, lightweight auditory feedback device. It allows a child to speak softly into it while listening to the clarity and rhythm of his/her words. This instant feedback encourages the child to make any necessary adjustments to his fluency or pronunciation as he speaks. Mrs. Lisa Collins uses these devices in her Southland Academy first grade classroom to help students practice reading aloud without disruption.